I’m napping in the cool air-conditioned 4×4 when we finally pull into the frontier town of Snuol in the afternoon the day before the election. The vehicle was a haven from the heavy humidity of central Cambodia, but the a/c is unnecessary up in these hills. It took me the better part of two days to get here and I’m tired from a week of work, then more early mornings of travel. I’ve been invited here by Sorya, a friend of my father’s who works for the ECCC (the court conducting the Khmer Rouge war crimes trials) and Khmer Institute for Democracy (KID) to monitor Cambodia’s national election with the Committee for Free and Fair Elections in Cambodia (COMFREL). It’s an exciting opportunity for me and my first experience as an international election observer. And with the current politics in Cambodia, there is a feeling across the country that anything could happen. Snuol is a sleepy place on top of a hill only a few kilometers from the Vietnamese border. When the sun sets, the lack of light pollution makes the darkness complete around you and a thunderstorm the night we arrive reverberates through it into my room. There is something oddly comforting about this but Sorya worries if the rain stays no one will want to come and vote. But we worried unnecessarily and the morning of 28 July dawns cool and bright. At 6:30am we arrive at the polling station we are observing, a few kilometers outside the main part of town. The majority of the population are members of the ethnic minority and hill tribe groups who live in the small villages here. The area outside the polling station is the yard of a brightly painted pagoda and it takes on the air of a festival in the early morning – the constant hum of arriving and departing motorbikes fills the damp quiet of Snuol’s otherwise green, forested landscape. This is rubber country and the trees stretch out for miles amid the gentle rolling hills around us, north to Kratie and the Mekong, and east into Vietnam. At 6am an entrepreneurial couple set up a shop selling rice packets and soy drinks, individually wrapped in plastic cups and bags. 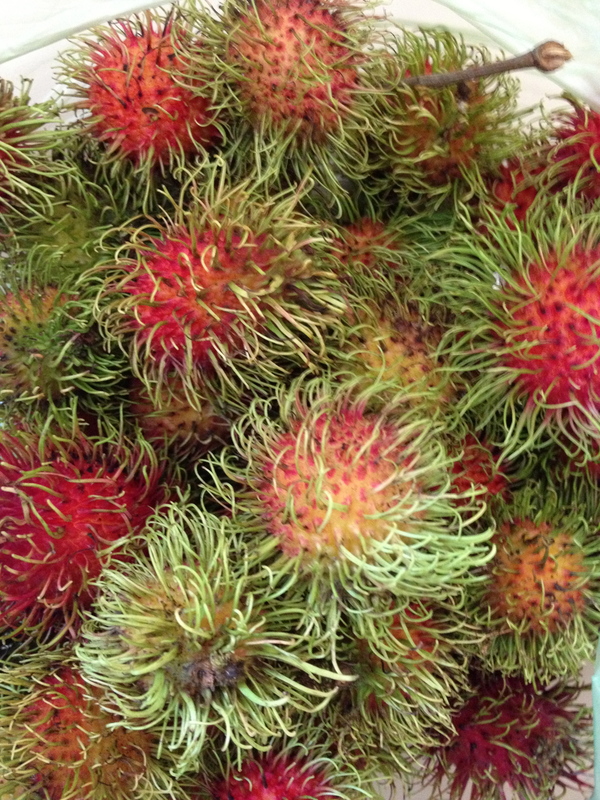 Rambutans are in season and the bright furry husks of the fruits tumble out of baskets across the yard. Women in brightly coloured pajamas with worn kramas around their heads will squat here for the much of the morning, chewing the small fruit or peeling them for their children. 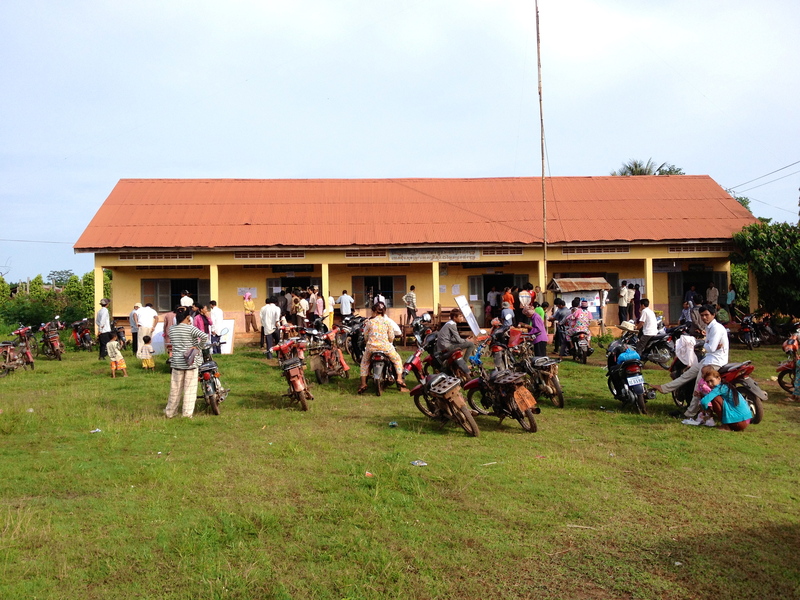 The polling station is housed in a small, two-room school on the pagoda grounds and before it opens at 7am a small crowd of people has already collected – scanning the list posted outside for their names, or simply perched on their motorbikes or the relocated desks from the school waiting to vote, or perhaps just waiting to see what happens. After we examine the interior of the station, noting the empty ballot box and witnessing it sealed, the polls open. Our scrawny security guard lets one person at a time into the station while a dozen or so curious, patient faces peer into the dark room. I sit at the side of the classroom watching quietly, and trying not to bump my head when I stand up – strings crisscross the ceiling of the room, holding up coloured pictures of animals and paper lanterns hung by the children who study here during the week. Each voter enters the room, checks at the registered list, receives their ballot, marks their vote, and then pops it into the box. Many grin when they finally have their finger dipped into the bottle of indelible ink and watch the stain spread – there is much shaking of the finger after, purple drops marking the scuffed floor. By mid-morning, everything seems to be going smoothly – smoother than expected – and we drive to one of the more remote polling stations to speak to the people voting there. These people are mostly farmers or labourers in the rubber plantations. Many are illiterate, and it is unlikely there was much political campaigning here in the month leading up to the election. However many of them are voting anyway, holding up their fingers to show the deep purple dye. We ask them what they think about the day. A few shrug and say it’s the same as last time, but they still vote. A tiny, wrinkled old woman chewing betel says nothing will change but her finger is marked like everyone else. Out here, we learn that people lined up as early as 5:30am to cast their ballot. After, they lounge in hammocks or stop for breakfast noodles – there isn’t much else to do today as they wait for the predictable results. As the morning wears on, the whole area takes on the feeling of a holiday. When we pull over to visit a small shop, a group of men in the yard across the lane crouch shirtless on the ground across from each other holding flapping, angry roosters. As we visit people in the hill tribes, we hear from observers in the capital that the indelible ink isn’t as indelible as expected. Some of our colleagues believe it is easy to rub off and, possibly, revote. This is a major issue, as events leading up to the election have warned of a wildly inaccurate voting list that may allow ruling party supporters to vote more than once at different stations, and leave out the opposition completely. We decide to test the ink and buy plastic water bottles full of rubbing alcohol, diesel from a roadside stall, and fresh limes. We test on four different volunteers from three different polling stations: people who have voted within an hour, within twenty minutes, within five minutes, and one person who had just stepped out of the polling station. We immediately call the result to Phnom Penh: the ink is indelible after all, despite enthusiastic scrubbing by our test subjects. As the day stretches into afternoon the activity around the voting areas dwindles. The air is growing hot and heavy and dark thunderheads in the east indicate the humidity is about to break. The only sign of activity is in the thousands of dragonflies that fill the yard outside, cutting through the haze. For the last two hours the polls are open, only a few people come to cast their ballot. Our polling officer chain smokes on the porch outside the office in the downtime, the girl in charge of the register sits hunched over her desk, doodling on an unimportant piece of paper. Then it’s over. Three o’clock and across the country the ballot boxes are closed. The day has gone unexpectedly smoothly. I was warned of intimidation, of threatening from local police and soldiers, of the likelihood of campaigners giving out bribes to local people: apparently my Siem Reap boss’s final words to me “Don’t get killed in Kratie” were unwarranted. I’m still waiting for something to happen, and eye the soldiers sitting on their motorbikes across the pagoda yard. They’ve watched us all day but look more bored than anything else. There have been minimal problems at our station. That’s not to say there weren’t some: there were issues with identification, and locating polling stations – these will be noted in our report – but I doubt it was a concerted effort by the polling officer to give anyone trouble, and expect it’s more likely simply a result of general issues in this area of illiteracy, or poverty, and unawareness of the issues. When our polling officer made mistakes, I believe it was because he was inadequately trained not because he was trying to prevent people from voting. But once the ballot box has been closed, we sit down with the six officers at our station and agents representing the ruling party and the two next biggest, and we witness the count. One major problem erupts when a small, unpopular party is left out of the count because of a mistake made while numbering all of the parties at our polling station. No one seems to be concerned when these few ballots disappear into the “spoiled” pile. As an observer this was a travesty, and will be a priority in our report. But despite all of this, the final count is finally made, and results are expected: overwhelmingly, the ruling Cambodia People’s Party has won. With the end of the day, we head back to town. My election has been a quiet affair, but it has indicated to me how much more attention must be made to the hill tribes and ethnic minorities in this area who are not given proper information about the issues by the campaigning parties, because no one seems to remember they’re there. We wait to hear about national results, but it’s difficult. I keenly feel the unavailability of the internet and English-language television when one of our Cambodian team members receives a phone call from Phnom Penh: violence has broken out in the capital after an altercation during the count, resulting in gunfire. No one knows what is happening. Almost immediately, I start receiving text messages from friends across the country, that, contrary to the expected results in Snuol, the CPP wasn’t winning the landslide everyone predicted. In fact, the Cambodian National Rescue Party – led by Kem Sokha and the recently-returned-from-exil-but-not-allowed-to-participate-in-elections Sam Rainsy, is starting to win in some of the bigger provinces. This is wildly unexpected. Despite excitement and massive political rallies in places like PhnomPenh, Siem Reap, and Kompong Cham supporting Sam Rainsy’s return, no one thought his party would actually win anything – in fact media reports have indicated that with the suspected issues with the voter lists and identification issues, his supporters were unlikely to be able to vote. As the evening progresses, more calls from around the country: my boss in Siem Reap warning me avoid the capital on my way home – the military is apparently massing, and there are protests in the streets, more violence. In Siem Reap something is on fire and cars are being rolled. The National Election Committee is calling a secret conference with no media allowed. What is happening? I suddenly deeply regret forgetting to pack my passport (who does that?). But all was quiet in Snuol, on the eastern frontier. But before I fall asleep, I receive the final numbers via phone call and text message from friends: the excitement was short-lived: the CPP wins with 68 parliamentary seats, barely ahead of the CNRP with 55: Sam Rainsy’s party has doubled their parliamentary power. 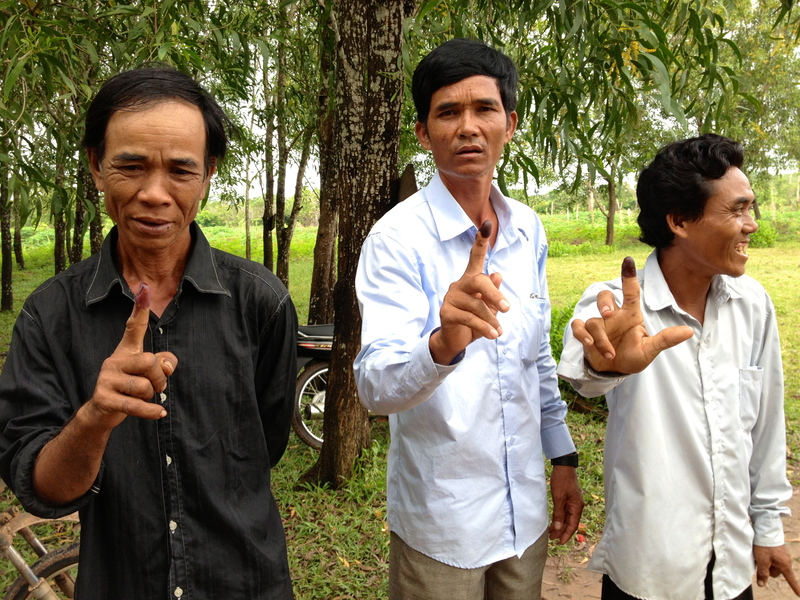 The closeness of this election is a breakthrough for Cambodian politics. It shows that the youth of Cambodia – who make up a massive amount of the population – care about what happens here, and are not afraid to demand change. To have these voices reacting against the longest serving political leader in southeast Asia shows Hun Sen’s hope to create a family dynasty may not happen after all. 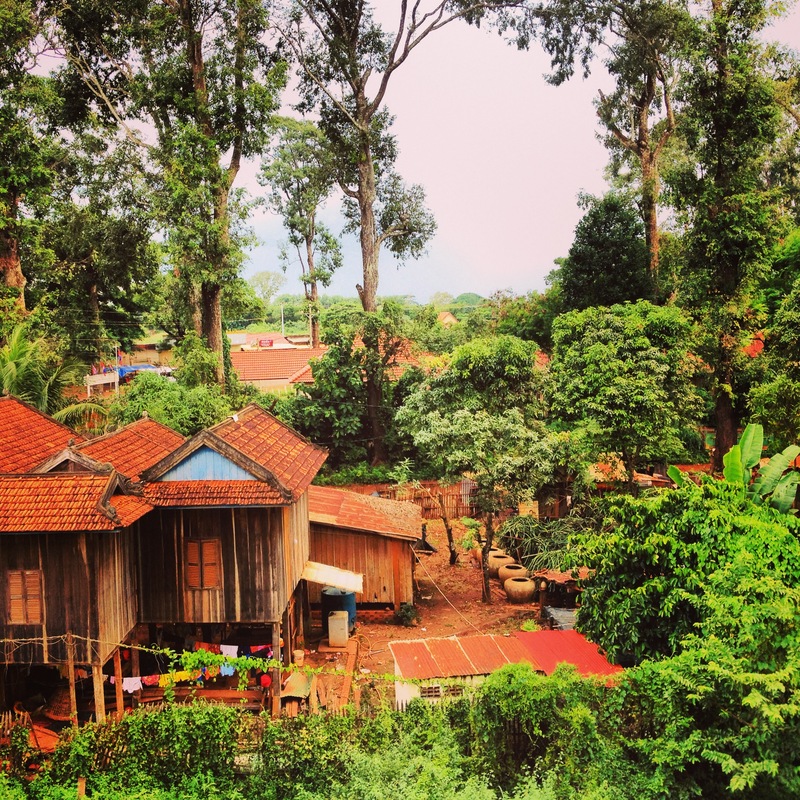 And my experience in Cambodia’s wild, green east shows something too. If there is a chance for real dialogue in the country between two parties that both have some political power and political clout, then the people who live in remote, rural areas can no longer afford to be forgotten or ignored. If there are two major parties, they will have to engage each other, they will have to face the reality of life in rural Cambodia, and work to increase literacy, to ensure every citizen has a national ID card, to expand land title projects. And the people I have spent the last 5 months working with will be an essential part of that process. 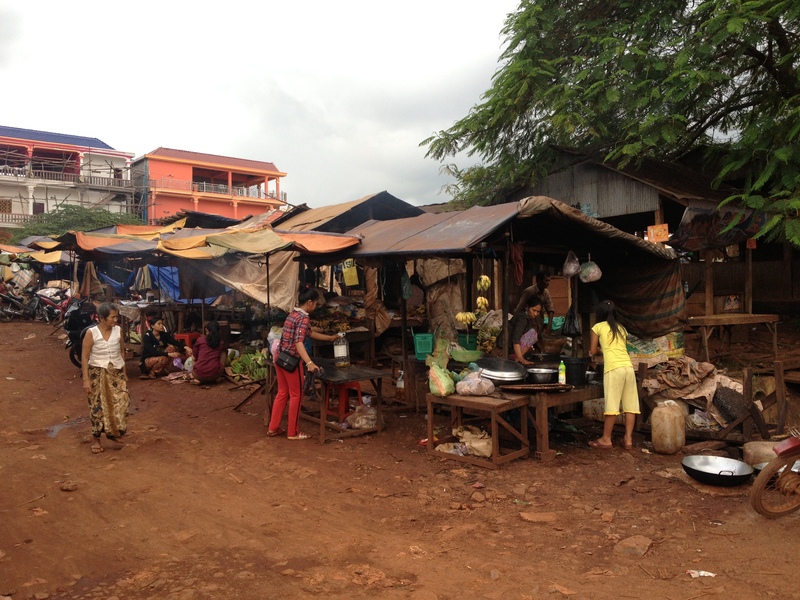 My time in Cambodia has been working with the very poor, the disabled, the illiterate, and the stateless. 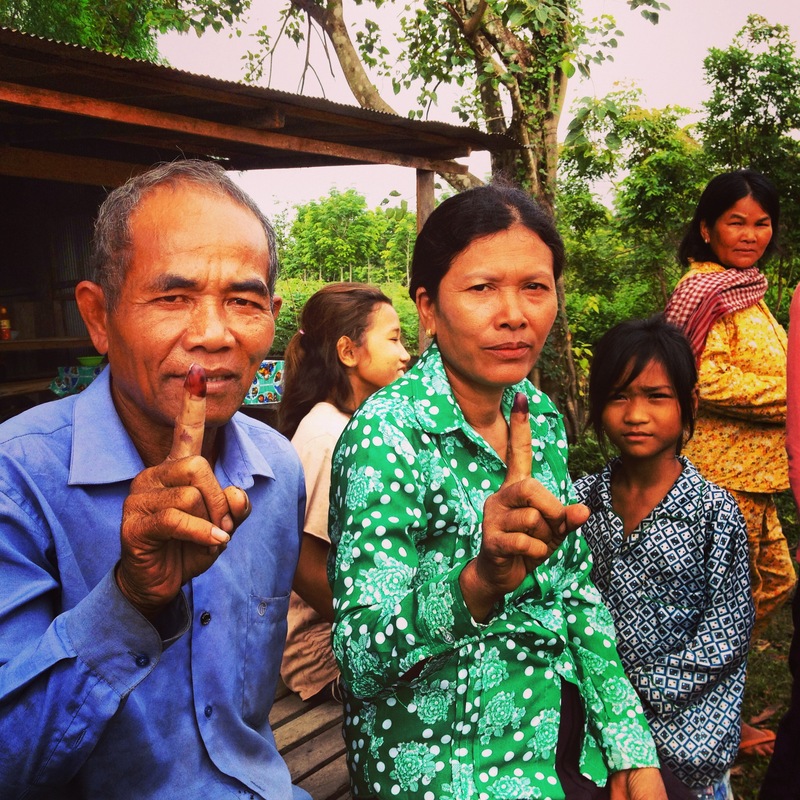 If the government has been shocked into realizing that every vote does, in fact, matter, then maybe it’s finally time Cambodia will begin to see some change. The election was yesterday, and I write this from the bumping front seat of our vehicle as we make our way back down from the hills, through misty rubber plantations in the early, pre-dawn day. So I don’t know how to finish this, because I don’t know what’s going to happen next. But we should keep watching. The polling station I was deployed to. Middle-distance runner, cycling enthusiast, adventure-seeker, thunderstorm-chaser, voracious reader, indie music lover, northern dreamer, fitful writer. Advocating, investigating, teaching: disarmament, rights, protection. Life in post-conflict zones. On hiatus. Interesting stuff Devin – thanks for the post. Congrats on getting some election observation experience too! Watch yourself and stay safe.